Saturday had a slow start, with a sleep in and breakfast before driving to Robina, setting up camp, and then going back to sleep. Rego and bike/uniform check was at 12:30 and my racking was at 2:45 so I found a nice shady spot to rest before setting up transition and warming up for a 3:30pm start. 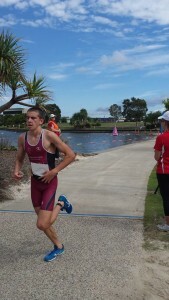 Today’s race was round two of the Australian Junior Triathlon Championship. Well where do I start, I was already exhausted from the race just hours before. 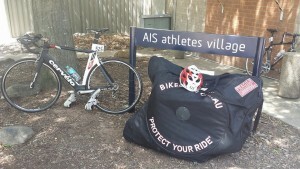 Once arriving at the Australian Institute of Sport (AIS), and finally finding where I had to be, I collected my room keys and put my stuff down. Aft er landing we went for a drive, to check out the race course, have bikes inspected and passed through the ITU procedures. 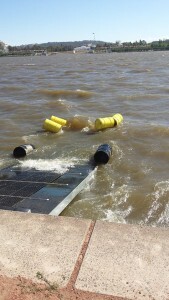 It was extremely windy, and the lake was closed for swimming due to the rough conditions. Race briefing outlined the new rules of racing, and explained the course and timing points. Local race, what does that mean? Sleep in, and lots of club support!!! racking. Thanks to CONOSCO for the race entry. It was quite an early start leaving at 3:50am, and especially after a late night curtesy of Mitchell, happy 18th bro. The lead up; the last couple of months contained lots of swimming, a bit of cycling, and very little running, the perfect lead up going into a running race. Being my local race and home ground, I did not have to leave until 5:30am, giving me a sleep in and a casual mood. I was racing in my second Opens race, and wanted to improve on my last race. I felt normal going into the race, nothing different to any other day and walked down the pontoon to race briefing. I dived in and secured a clear starting spot in the swim, and as the gun went off I sprinted as fast as I could. It was a short swim, allowing me to come out mid-way through the field and run through transition gaining time. Firstly I would like to say a huge thank you to CONOSCO for their generous support and funding, making this next stage of my racing possible. Now on with the report. 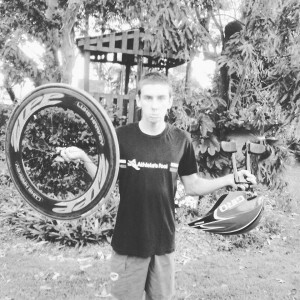 Well I was pretty keen, I got to use my new Zero Athletic tri bag,but also nervous to do my first open race. Well the day started a bit later than usual, leaving home at 5:30 am. It was an hour’s drive to Murrenbong and transition/rego closed at 7:30. I was given slightly different gear whilst registering, instead of sticking your number around the seat post, it was placed on the handlebars, and there were also no helmet stickers. 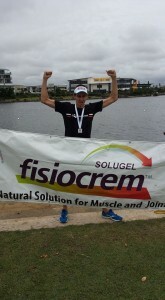 My race began at 8:33 and I began my warm up around 8am, as I was doing the long course enduro.